The answer is no, but here's what you need to consider. If you look at the line up of horses who compete in Olympic level dressage, the first thing you'll notice is that the majority are warmbloods. So does this mean that dressage is only for warmbloods? First, ask yourself this question: Are you interested in dressage because of its fitness benefits for you and your horse (like Pilates or dance), or because you want to compete successfully at the upper levels of the sport? To put this in perspective, many people take ballroom dancing or martial arts instruction because of the many benefits that such instruction brings them. Fitness. Socializing opportunities. A sense of mastery and accomplishment as one moves through the levels. Others, however, want to compete at the top levels. And that means having a dancer's body and the right partner. If you goal is to improve your horse's strength, agility, stamina, and longevity, then any breed of horse can be your partner. Or to put it another way, dressage (ridden properly) improves any horse—from pony to thoroughbred to warmblood to draft. But if you goal is to compete successfully at the upper levels of dressage, a warmblood may be your best bet. But the thing to remember is this: Not all warmbloods have dressage conformation, and not all horses with great dressage conformation are warmbloods. The key lies in the pelvis. 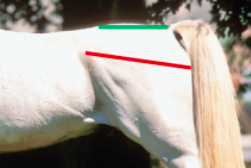 As equine biomechanics expert Dr. Hilary Clayton points out, ideally, the pelvis of a dressage horse should be long to give a large area for attachment of the propulsive muscles, and it should have a moderate slope to facilitate tilting the pelvis, lowering the haunches and moving the hind legs forward under the horse's body. The horse on the left is a warmblood with ideal dressage conformation. Notice how the hindquarters are long and slope downward. The middle horse is an Arabian that is ideally suited to race short to middle distances. Notice how short and flat the hindquarters are. But now look at the horse on the right. That, too, is an Arabian—an Arabian with ideal hindquarter conformation for the sport of dressage. As people become better educated about "dressage conformation", more non-warmblood breeds are cropping up in dressage competitions, winning ribbons even at the highest (FEI) levels. I will offer one caveat, though, based on my experience. Some years ago, I attended a USDF L level judge training session. Included in the session were demo riders at various levels of dressage. A local trainer proudly rode his horse into the arena for a second level demonstration. One of the candidates became quite agitated as the trainer rode his horse beautifully through several second level movements. Finally, the candidate could not contain his frustration any longer. "Excuse me, but there is one big problem here. That is NOT a second level horse." One by one, other candidates chimed in claiming that the horse was not a second level horse. The USDF instructor insisted that the horse was indeed well-developed and properly trained. Finally, to put a stop to the kvetching, the trainer piped up and said, "I've just started him on second level training." What was the problem? The trainer was riding an Arabian, and the candidates had a certain image in their minds of what a "real second level dressage horse" looks like, namely, a large muscled up warmblood. Arabians are slender and delicate looking, yet incredibly powerful and strong. When they have achieved collection, they don't "look like" a warmblood. So how well you score at dressage competitions when riding unorthodox horses will depend in part on how familiar the judges are with unorthodox horses. Some will simply have no idea how to judge such a horse. Other, more experienced judges, will see the horse's development and performance with more objective eyes. You can read more about degrees of collection here.